The Parade starts at 8:30 p.m. Please plan on assembling no later than 8:00 pm in the North Park blocks at 9th and Burnside. The PGE Starlight Parade is one of the most popular Rose Festival events that offers something for everyone and draws more than 250,000 spectators to downtown Portland! The Starlight parade features everything from traditional marching bands and flood lit floats to glow in the dark umbrellas and hand built entries! Please plan on joining the Prime Minister and the Queen of Rosaria in the Spectacular Starlight Parade! You may contact the Parade Chair with any questions you may have about the Starlight Parade. The Hotel Deluxe is located at 729 Southwest 15th Avenue, Portland, OR 97205. It is the informal Starlight Parade Headquarters for Royal Rosarian activities before, during, and after the Starlight Parade. While not required, you are encouraged to make no-host dinner reservations at the hotel’s restaurant Gracie’s, 503.219.2094, prior to the parade to enjoy time with Rosarians and their guests. Rosarians and spouses/partners who are unable to march are invited to attend the complimentary Hosting by Starlight event in the hotel’s Screening Room, where the entire Starlight Parade may be viewed in high definition. No-host small bites and beverages are available from the Driftwood Room Bar menu. AFTER the parade, the Rosarian Marching Unit returns to the hotel for complimentary snack and no-host beverages at the exclusive Hosting by Starlight party at the Hotel deLuxe. If you have any Questions about Hosting by Starlight you may contact the Chair of the event. The Rose Festival Junior Parade starts at 1:00 p.m. in the Hollywood district of NE Portland along Sandy Blvd. Please plan on assembling at 52nd and Sandy at 12:30 and all Band Marshall's please plan on being in the formation area at 56th and Halsey at Normandale Park at noon. Typically the junior parade is televised live on Fox 12! The Lovable Fred Bear makes a special appearance as he cuts the ribbon that commences the Fred Meyer Junior Parade. Fred will be joined by other popular mascots and the Rose Festival Court Princesses’ during the one hour live broadcast! There will also be marching bands from elementary and middle schools from around the greater Portland and Vancouver metro area, as well as school groups, scout troops, children's organizations, youth groups, and families! The Children love to dress in costumes, build colorful floats towed on wagons or ride on bikes decorated with flowers, crepe paper, streamers and balloons. Please plan on being a part of the oldest and largest children's Parade in the nation and having a lot of Fun! For those that are participating in the Parade there will be a shuttle service provided at the end of the parade that will take you back to the formation area. If you have any questions, please contact the Parade Chair or Parade Shuttle Chair with questions. 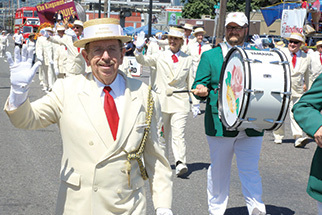 The Spirit Mountain Casino Grand Floral Parade is the Crown jewel of the annual Rose Festival! At 8:30am, the Rose Festival Queen’s Coronation takes place at the Portland Veterans Memorial Coliseum. This exciting event of crowing our new Queen of Rosaria will mark the beginning of the spectacular Grand Floral Parade. The Parade will then begin at Portland Veterans Memorial Coliseum and wind its way through beautiful downtown Portland. This year is going to prove to be a very Special Grand Floral Parade! Please plan on joining the Prime Minister and your fellow Royal Rosarians in the Grand Floral Parade! Please plan on assembling no later than 9:30 am at the corner of the south parking garage near N Drexler Dr. and N Interstate Ave. You may contact Parade Chair Neal Brown if you have any Questions.